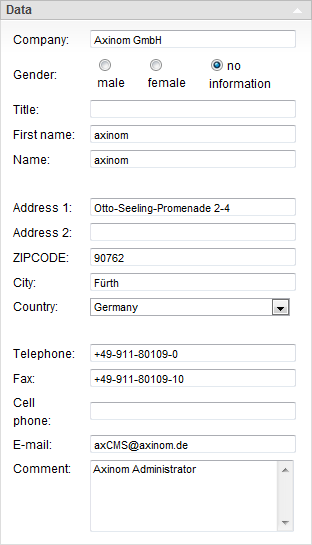 AxCMS.net differentiates between users and members. Users are administrators, editors, publishers etc. working with the Management System; members are registered users of the Live System. Please note that some functions are only available after saving. Such points will be explained in each case with corresponding remarks. 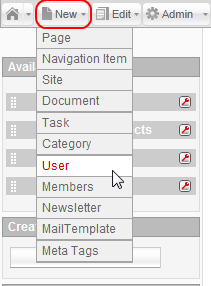 To create a new user, go to New -> User OR Admin -> User and click the New button on the left under the New section. The User Detail Page opens, where you can define the details of the created user account. GUID (Globally Unique Identifier) of the user. Date and time of user activation (or reactivation). With the Block/Unblock button, it is possible to temporary block the user, as well as lift the block. 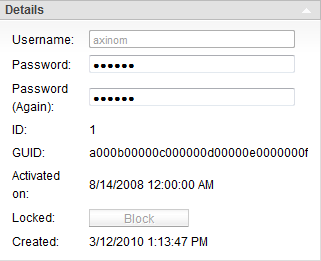 This button is inactive if you are editing the user you are logged in to AxCMS.net with (as seen on the image above). Date and time of user creation. Assign a category to the new user. Assign the new user to some navigation point. 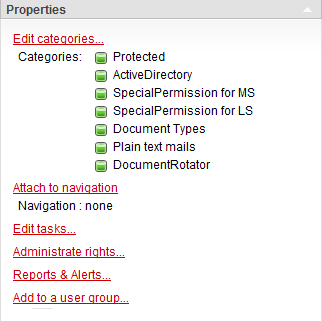 Allows you to create tasks with this user, assigned to either the same or some other MS user. Opens a popup where you can assign roles and rights to the user. Assigned rights are displayed in the View Rights section of the popup. More about that in Rights and roles. Allows you to manage reports and alerts for the user. Opens a popup where you can select a user group for the user. If no group exists, you can create a new one here. All the properties of the user group are also assigned to the user belonging to that group. Notice that roles and rights inherited from a group cannot be disabled without removing the user from the group. 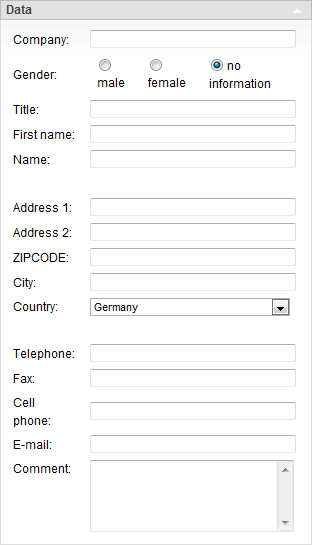 The Data section contains different fields for adding various data for the new user. 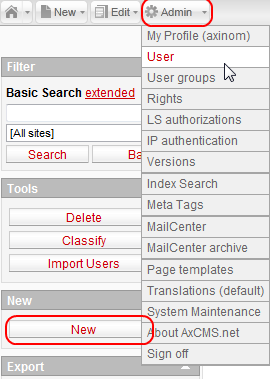 The Tools section is located on the left side of the UserDetail page. The Relations section and some buttons appear only after saving. Saves the changes to current user. After saving you are taken back to the UserOverview page. Saves the changes to current user. After saving you remain on the UserDetail page. Takes you back to the UserOverview page. No changes will be saved. Opens a new UserDetail page for creating a new user. Opens a popup window with the DependeciesResolverOverview page. 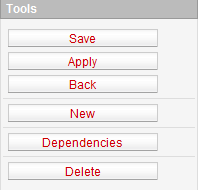 Here you can view and manage the dependencies of the current user. 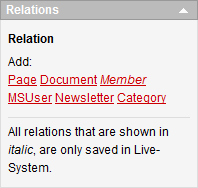 In this section you can add and edit the relations of the current user. To create a new member, go to New -> Members OR Edit -> Members and click the New button on the left side of the page in the New section. The User Detail Page opens, where you can define the details of the created member account. The unique ID of the member. GUID (Globally Unique Identifier) of the member. Date and time of member activation (or reactivation). With the Block/Unblock button. 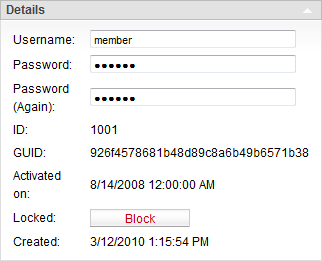 It is possible to temporary block the member, as well as lift the block. Date and time of member creation. 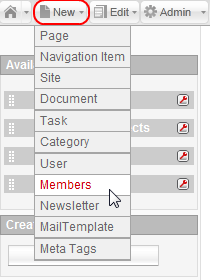 Assign a category to the new member. Assign the new member to some navigation point. Opens a popup where you can select a user group for the member. If no group exists, you can create a new one here. 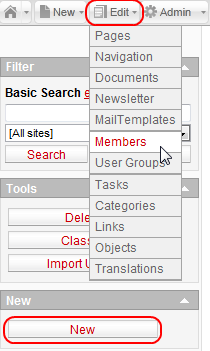 All the properties of the user group are also assigned to the member belonging to that group. 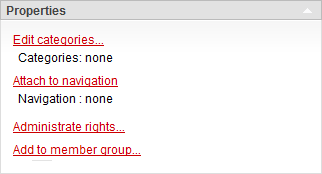 Notice that roles and rights inherited from a group cannot be disabled without removing the member from the group. Saves the changes to the current member. After saving you are taken back to the UserOverview page. Saves the changes to the current member. After saving you remain on the UserDetail page. Opens a new UserDetail page for creating a new member. Opens a popup window with the DependeciesResolverOverview page. Here you can view and manage the dependencies of the current member. 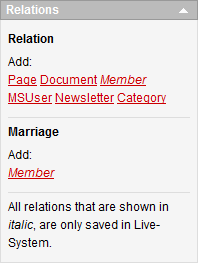 In this section you can add and edit the relations of the current member.